Simon Gabe is a Consultant Gastroenterologist at St Mark's Hospital in Harrow. St Mark's has a National and International reputation in disorders of the gastrointestinal tract, especially inflammatory bowel disease, nutrition and intestinal failure, endoscopy and complex surgery. He Co-Chairs the supra-regionally funded Intestinal Failure service, one of two centers in the UK funded to provide this service. He was appointed as Senior Lecturer at St Mark's and Imperial College in 2000. Since 2005 this has become an NHS appointment. His MD thesis was on intestinal permeability in critical illness and he also has an MSc in Clinical Nutrition. Dr Gabe has a wide clinical experience in dealing with complex inflammatory bowel disease, especially with fistula development as well as intestinal failure, clinical nutrition and home parenteral nutrition. 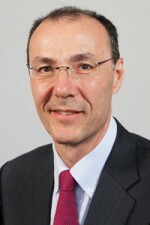 His academic and research interests include nutrition in its different guises (nutrition screening, hormonal control of appetite, modulation of parenteral nutrition in intestinal failure, nutritional treatment with enterocutaneous fistulae), home parenteral nutrition (survival & different growth factors), intestinal transplantation, intestinal tissue engineering. Dr Gabe gives around 30 invited lectures per year, based in nutrition, inflammatory bowel & liver disease. In addition, Dr Gabe is Honorary Treasurer and Caldicott Guardian for BAPEN and Secretary of the St Mark's Foundation. He recently co-founded the National Adult Small Intestinal Transplant Forum together with Addenbrooke's Hospital and has an honorary contract at Addenbrooke's as a visiting specialist.